The following post is written by my fiance and frequent guest eater, Taste Tester #1. The life as the partner and frequent guest of a food and culture blogger isn’t too bad. I get to eat tasty food, meet new and interesting people, and go to events and venues that wouldn’t typically be on my radar. Little did I realize that after proposing to such blogger, many of the fun events would have to take a backseat to the demands and stress that come with planning a wedding. Dammit, why didn’t I think of this before making the trip to the jewelry store! But all is okay, as once or twice this summer, Stephanie gave us the green light to cheat on the wedding diet and go to a fun event and I’m lucky one we chose to attend was The Brooklyn Brewery Mash. The Brooklyn Brewery Mash Tour was a week long event in our great city of Chicago the week of Aug 9th– Aug 15th. Highlighting their beer throughout, events included beer tastings, a podcast taping, a cooking class and more. 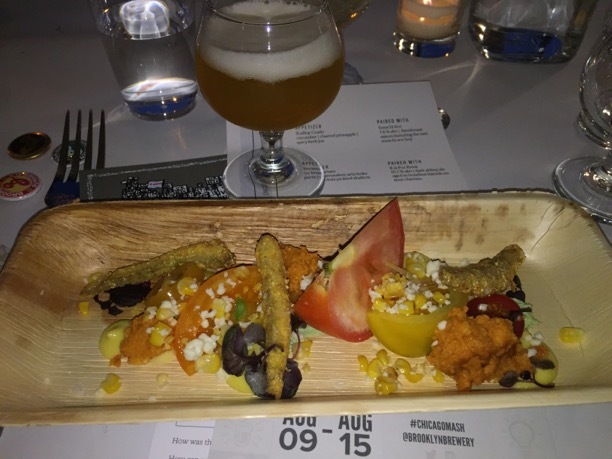 We were able to attend a great event that paired Brooklyn Brewery with Dinner Lab, a secret pop-up supper club. Hosted by chef’s Andrew Gerson and Daniel Espinosa and led by Brooklyn Brewery Brewmaster Garrett Oliver, the event was the exact type of collaboration a food and beer lover dreams of. Held in the perfect nod to NYC, the “secret” space ended up being the Hairpin Arts Studio in the Logan Square neighborhood, and the room has the same architecture design as the flat iron building in Manhattan. Whether this was on purpose or not, it was a nice touch. Stephanie and I have never participated in a Dinner Lab event and it was neat to get a preview of what they are all about. Upon arrival, there were two different appetizers being passed around that were paired with specialty beers from Brooklyn Brew. First was a scallop crudo, accompanied by cucumber, charred pineapple and spicy herb jus. They paired this was a farmhouse saision which was said to feature the rare sorachi ace hop. Great light and citrus forward first pairing, a perfect starting point. The next appetizer to try was a venison tartare that came with Jerusalem artichoke puree and pickled shallots. The pairing here set the tone for the night, a 10.1% abv dark ale, aged in bourbon barrels on sour cherries. Really bold flavors out of both but still managed to not come off as heavy before the main courses. One of the highlights of the evening was listening to the Brooklyn Brewmaster Garrett introduce the dishes and beers and we were lucky enough to have him at our table. His love for his job is palpable as he’s passionate about good beer, travel, and the editor-in-chief of The Oxford Companion to Beer, author of The Brewmaster’s Table and winner of the 2014 James Beard Award for Excellent Wine, Beer or Spirits Professional. The first dish that was introduced was an Heirloom Tomato Panzanella with fried smelt, Cholula corn emulsion, queso fresco and cornbread croutons. The brew paired this dish with the Sorachi Ace Ghost Bottle. Another crazy brew as this one was aged on heirloom tomatoes and sunflower petals. Just as you’d imagine the dish was very aromatic and light. You need to mentally feel like the stomach isn’t too full when you’re loading up on 9 and 10% abv. brews! The fresh tomatoes, cheese and emulsion were all fresh, the smelt was a great addition of natural saltiness but let’s be honest, cornbread croutons…crowd pleaser! Next was a pork cheek accompanied by a beer name the Galahad; a Belgian golden ale also aged in bourbon barrels. The pork cheek came with shaved fennel, celery root puree, orange and a tangerine lace. The Galahad was delicious, a great drink even for someone who doesn’t typically favor beer. It was explained that it’s aged the same way as a natural cider fermentation, an unexpected flavor combo that comes off as cider and the candy Pez! The pork cheek wasn’t as heavy as you might picture, had a great braise and the fennel, orange and tangerine were great. All in all a fruity dish that really had some unexpected and interesting flavors going on. After some delicious savory dishes throughout the evening, the chef’s treated us to a great desert. Honey salted ice cream, corn cookies and lavender compressed peaches all paired with a 10.6% abv. big boy beer, a Belgian stout. The desert was sweet and smoky all at once, and the stout was great with the little saltiness coming through in the ice cream. All in all a great evening and while conquering the real world the next day was a bit rough, this event wasn’t one too miss. If you are a beer drinker, you’re likely familiar with Brooklyn Brewery’s summer ale but go out to your favorite liquor store and try some of their other options you have yet to sample. For those on the fence about ponying up for the Dinner Lab membership, if you are a foodie already spending a decent amount on your meals then maybe it’s something to explore further. The evening was professional, delicious and as explained to us by our tablemates, each dinner is unique in its own right. Thanks to Brooklyn Brewery and Dinner Lab for a great night out on the town.